We saw that the game ends when neither of the opponents have any useful moves. We rewind the game 10 moves backward to a position where the moves can still gain points. On the diagram below you can see the "starting position". A marked white stone at the top is under atari. There are some places on the board where the territory is not completed. The squares show points that can become territory of one of the opponents or neutral. The next diagram shows how these last points were taken. White played awfully, and lost a point!!! White's territory would have increased by a point marked with a square. The circled points were neutral. See explanations below. Why White 1 in the previous diagram is the largest move. Because if Black goes there he threatens to take one more point from White by playing on a squared point. So, White has to reply. Thus Black does not lose the initiative. Such moves that don't lose the initiative because the opponent has to reply are called sente. Sente moves should be played first, especially in the ending of the game. 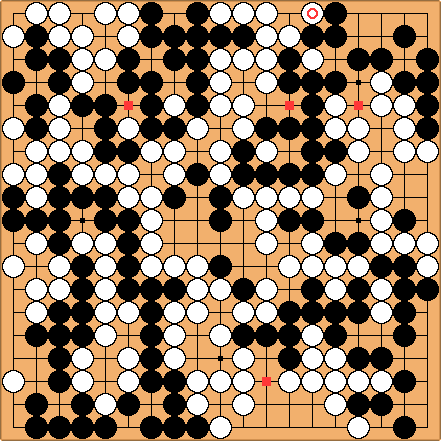 In the initial position White does not have sente moves. So, the next most important are moves the prevent sente from your opponent (so-called reverse sente). Therefore 1 is the largest move. White has one stone in atari. Isn't it important to save it first? No, saving the stone in atari in this situation is the least valuable move, because it is not sufficient for Black to capture this stone. If Black captures he has to prevent White from capturing it back. White cannot capture back immediately because of ko rule, so Black will, possibly, have an opportunity to connect. But he has to make two moves to get one point for the captured stone. Half a point per move is very small, smaller than the one-point moves that are left on the board. White continued to play wrongly. Moves 5 and 7 were plays at neutral points that wasted ko-threats; move 9 should have been at 10 and after Black captures the stone on the top, White could still fight a ko to win by 1.5 point. Explanations can be found below. If that is understood (or not interesting) skip to PGB271. BillSpight: Just a quick assay of the sizes of the plays, using miai counting. Bill: Also, Black 6 in the game leaves behind a ko threat at a. Better to take the two White stones with Black b. By the same token, Black 4 would be better at Black 10. If White plays at 10 she has a ko threat at c.